Troopers and Sith Lord arrived well before deployment time of 11:00 hrs. Troopers were first out for a little re-con and secure the shop front before the arrival of our supreme commander. Lord Vader was escorted through the shop with his finest troopers while the Imperial March was played on the shops intercoms. Lord Vader and Storm Troopers presence put local inhabitants at ease, when they realized that the Emperor’s compassion could extend to the outer rim territories. Many holopics were taken, and Adidas shoes walked out the door. Alas, even the most loyal servants get tired, and it was 13:00 hrs before we knew it. Public Incidents: 1 but wont go into it. PS. Personally i wish to thank all troopers and wranglers for their professionalism shown at the troop. 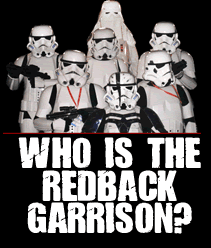 Redback Garrison leading the way. Some pics from today’s troop. Was a blast. This entry was posted on Sunday, January 17th, 2010 at 11:58 am	and is filed under Mission Reports. You can follow any responses to this entry through the RSS 2.0 feed. Both comments and pings are currently closed.